Here in Indiana, sweet corn is a thing to look forward to in the summer. It just doesn’t get much better than that. It should be knee high by the 4th of July is what they usually say. I feel like this year, the sweet corn came early and I am not complaining. 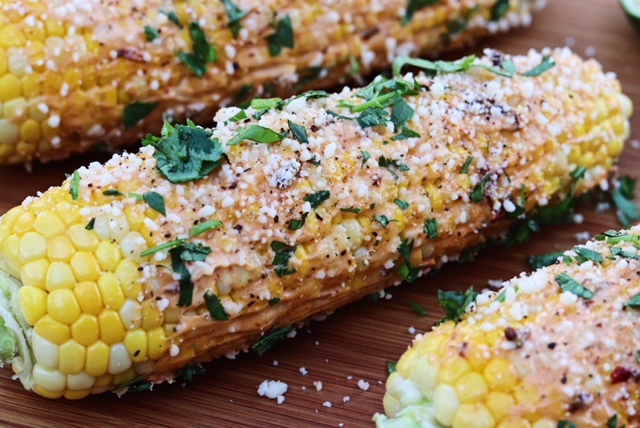 Here is a fun twist to put on your sweet corn to give it a different flavor. You’ll be pumped at how fast this comes together. Here we go…. All of the grocery stores are selling sweet corn which is where I picked this up at, but we have a local guy who sells the absolute best and when we get that, nothing goes on that bad boy except for vegan butter and some salt and pepper. How dare anyone mask any of that delicious sweet corn flavor. My sister now lives in Nashville and one of the things she says she misses living down there is the quality sweet corn we get up here. She said it’s just not the same down in Tennessee. Who knew? The first time I had a Mexican Street Corn was when my husband and I were on vacation in South Carolina. We had no idea what it was but it was on the menu and sounded delicious so we ordered it. Man am I so glad we did. The version we had the first time was slathered in pimento cheese, sprinkled with old bay, and topped with cilantro and cojita cheese. Holy smokes that changed my life. We went back to that same restaurant another night just to have more sweet corn. This was obviously before I was vegan so it was full of dairy, but I wanted to make my own version at some point. Ya’ll, this is it. First of all, to start, it’s very important that you remove most of the husk off of the sweet corn, leaving just one sheet to cover the kernels. Once all of them are done, soak these guys in a bucket of water for about 20 minutes to rehydrate. Meanwhile, preheat the grill. 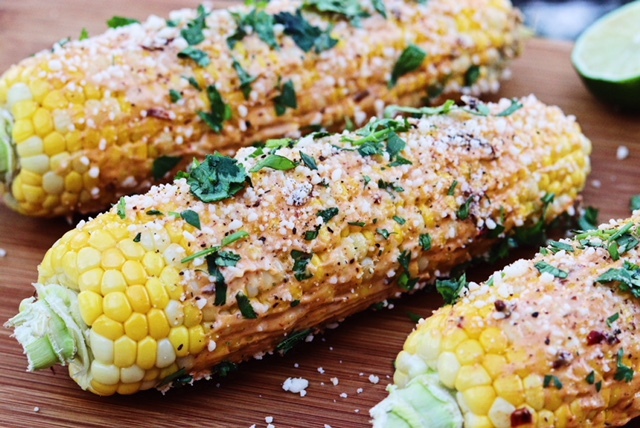 Once the grill is hot, throw the corn on there and cover it. You will end up rolling the corn around a few times, like you do anything on the grill to make sure the entire thing gets cooked. It should take anywhere from 20-25 minutes, depending on how high you have the heat. 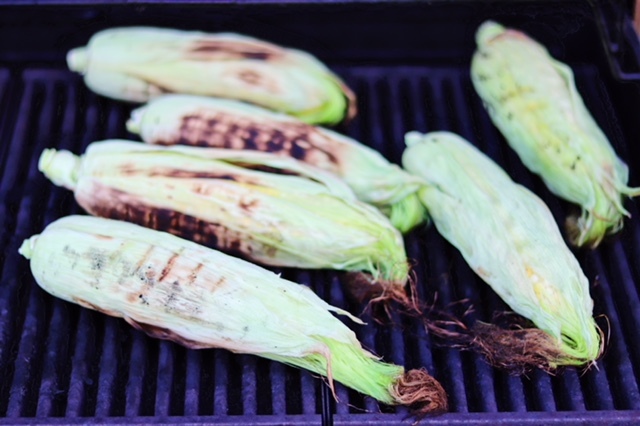 Be sure not to burn them, however, you do want some nice grill marks on the outside and some crispy parts on the actual ear of the corn are not bad either. To test, take a fork and pierce the corn. It should go into the ear without much force. When done, the corn should have a darker golden color. 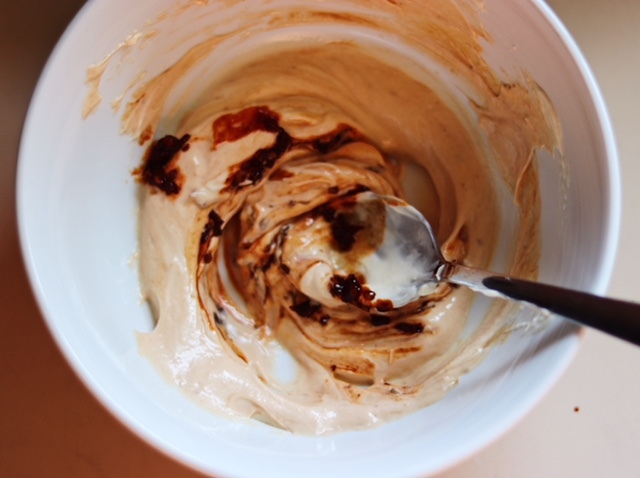 While the corn is doing it’s thing, start whipping up your chipotle mayo mixture. Chop the chipotle in adobo and add it to the mayonnaise mixture and stir. Taste it for spice and if you desire more, add more. If it’s too spicy, add more mayo to the bowl. Feel free to add a bit of salt to this as well. Next, chop your cilantro. and locate your parmesan. I use Follow Your Heart vegan parmesan because I feel it is the best imitation parmesan out there. It tastes like the real thing! Grab a few limes and cut those in half to squeeze on top of the corn as well. Once finished, remove the rest of the corn husks, paint on the chipotle mayo with a brush, and top with vegan parmesan, cilantro, and lime juice. I mean, just look at this goodness…..
Let’s take a closer look, too. Ahh, my mouth is watering just looking at these photos. That’s all folks. How easy was that? I hope you all love this meal. It’s such a fun way to dress up sweet corn, even though there is nothing wrong with going the straight butter and salt and pepper route. If you guys make this recipe, be sure to leave a comment and tag @plantiful_grub on Instagram and Facebook so I can see what you came up with. Until next time, enjoy! 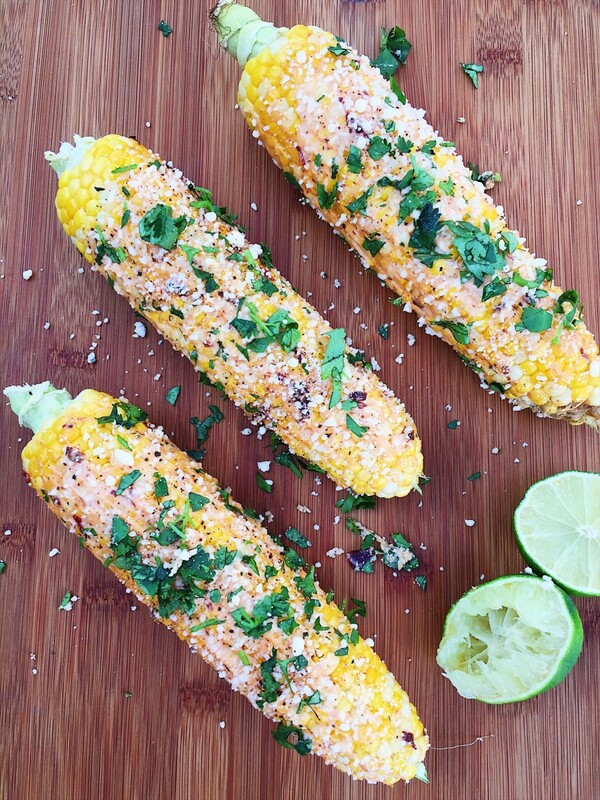 Put a twist on your standard sweet corn this summer with this Mexican Style Sweet Corn. Fast, easy, and delicious. Start by removing most of the sweet corn husk from all the ears but be sure to leave just a thin layer still covering the corn. 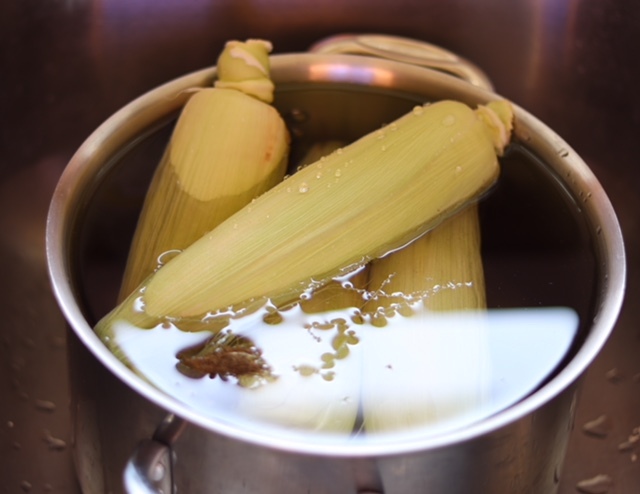 Once this is done, soak the sweet corn in water. Let these soak for about 20 minutes to hydrate the corn. Once the corn is done soaking, put it on the grill and cover. Be sure to check it occasionally so it doesn't burn. Flip until all sides are cooked and it is tender when pierced with a fork. About 20-25 minutes. While the corn is cooking, prepare the toppings. Combine the mayo and chipotle and set aside. Chop the cilantro and get the vegan parmesan ready. Once the corn is cooked through, remove it from the grill. The kernels should be a darker golden color. Let the corn cool. Once cool, remove the rest of the husk and paint on the chipotle mayo, sprinkle with the cheese and top with cilantro, salt and pepper, and lime juice. Enjoy!